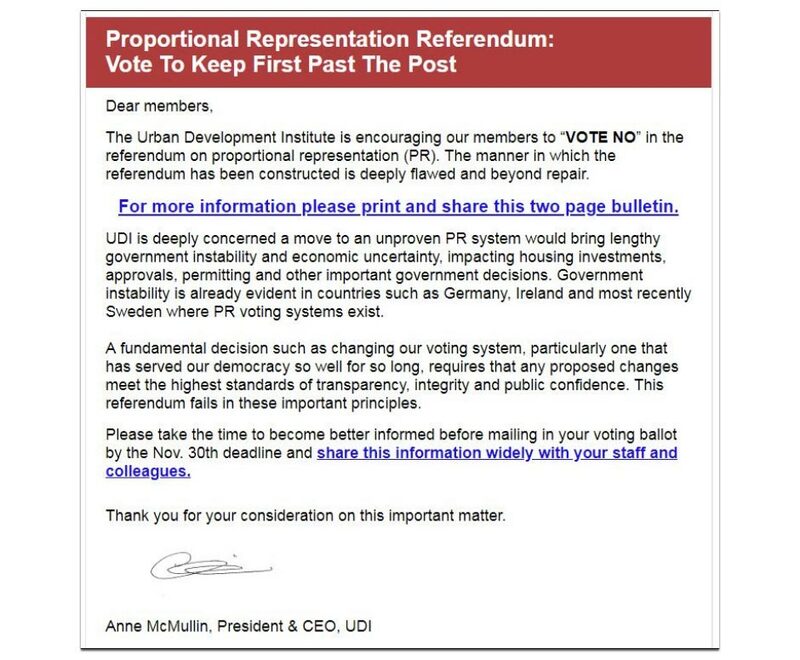 In a recent e-mail, Urban Development Institute CEO Anne McMullin urged the group’s members to “VOTE NO,” arguing that a more proportional voting system will make life harder for wealthy developers. “UDI is deeply concerned,” the real estate lobbyist noted. The UDI describes itself as the “voice of BC’s real estate industry” and regularly lobbies the BC government on behalf major real estate firms. Last summer, the group begged the BC government to let landlords hike rents for the province’s struggling renters and spoke against any future increases in protections for renters’ rights under the province’s Residential Tenancy Act. The UDI also opposes BC’s popular speculation tax and wants the provincial government to cut taxes for people who own real estate worth over $3 million in the province’s wealthiest neighbourhoods. 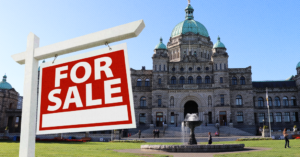 The powerful lobby group also criticized the Land Owners’ Transparency Act, a piece of legislation designed to clamp down on tax fraud and money laundering in BC’s real estate sector. 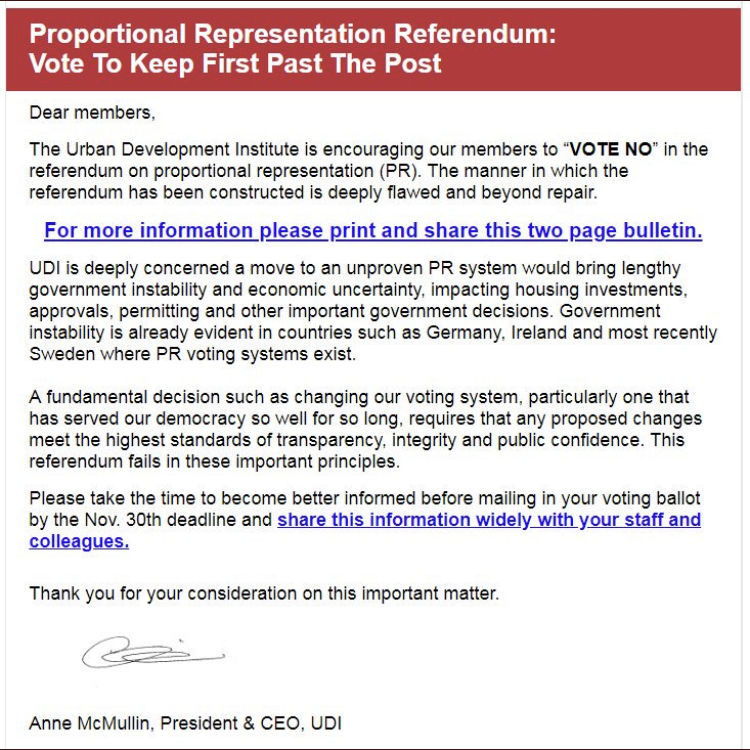 Leading UDI directors include Jon Stovell, whose company is currently trying to evict tenants from a 15-storey apartment building in Vancouver, recently claimed proportional representation has turned Sweden into a “train wreck” and predicted “intolerant parties” could end up “calling the shots” if BC adopts pro-rep (outside of BC’s three big parties, the vote share of all other parties combined during the last provincial election amounted to less than 2%). Earlier this year, a group of four UDI-affiliated companies announced plans to replace nearly 400 residential units with expensive high-rise condos in Burnaby. The plan is expected to displace thousands of renters. Other real estate corporations represented on the UDI board include Hollyburn Properties, a company that evicted dozens of tenants from a Vancouver apartment building in 2010, as well as Rize Alliance, a firm known for trying to replace affordable housing units with luxury condos in Vancouver’s Downtown Eastside. Also on the UDI board is Beedie Developments Vice President Houtan Rafii, whose company unsuccessfully tried to get permission to construct a luxury apartment complex in the heart of Vancouver’s historic China Town. 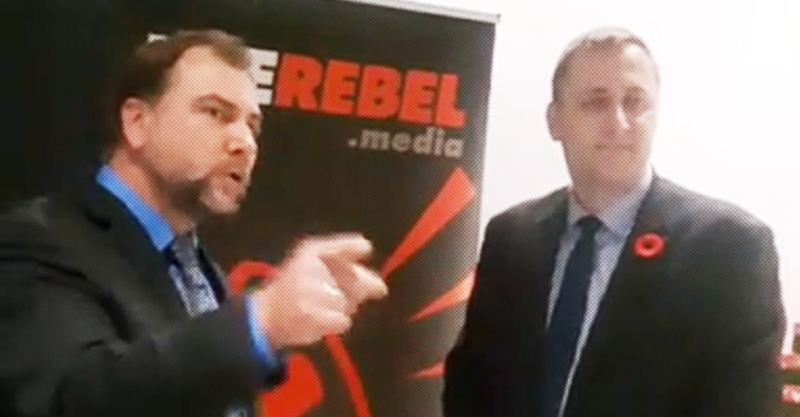 The company’s founder Ryan Beedie is a major BC Liberal donor as well as a top-tier donor to the official campaign against election reform in BC. In 2014, Aquilini’s property company kicked out residents from a historic apartment building in order to construct a plush 11-storey tower primed for wealthier clients. Under BC’s current first-past-the-post electoral system, corporate interest groups like the UDI can maximize their influence on government policy by only having to lobby one political party at a time. That’s because under first-past-the-post, one political party can wield 100% of the power despite receiving less than half the popular vote. While in government, the BC Liberals received around $12 million in donations from real estate firms, many of them linked to the UDI. Conveniently, real estate lobbyists were able to exercise powerful influence over the BC Liberal government’s housing policy. Christy Clark’s government was known for implementing developer-friendly policies and taking slow action on rising numbers of “renoviction” projects in Vancouver. The BC Liberal administration was also accused of turning a blind eye to money laundering and tax-fraud schemes connected to the real estate industry. Several top-donors donors listed on the official anti-reform campaign’s financial disclosure reports are major developers with interests in relaxing regulations in the real estate sector.